During solar storms the Earth’s atmosphere receives huge amounts of energy from the charged particles and ultraviolet radiation hitting it. A big solar storm can dump as much energy in the atmosphere as could power the whole of New York City for 2 years! Some of this energy we see as the aurora, but the atmosphere also heats up, and 95% of this energy is radiated back into space by carbon dioxide and nitric oxide. There really is so much more power up there than meets the eye as the aurora! Infrared emission of the atmosphere showing that much of the energy dumped into the atmosphere during a solar storm is re-radiated. 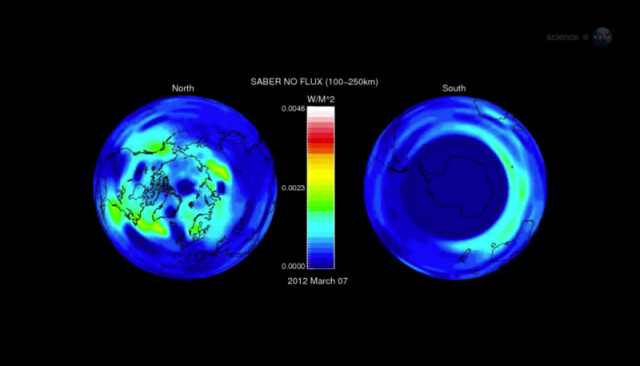 This video from NASA tells the story of a big solar storm in March 2012 and what was happening in the atmosphere. The SABER instrument on the TIMED spacecraft that NASA talks about measures the temperature, density and pressure in the mesosphere and lower ionosphere (40 to 110 miles above the Earth). Researchers are trying to understand if and how this affects weather and climate. SABER now has data across a whole solar cycle (higher and lower activity of the Sun) which helps them differentiate the Sun’s effect on the atmosphere from other effects.